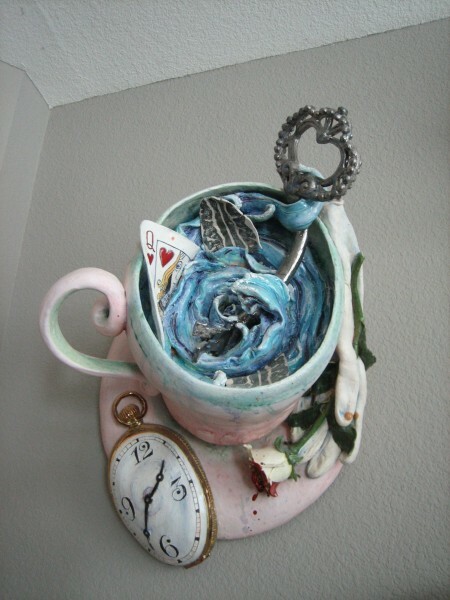 Walking into ceramic artist Linda Fitz Gibbon’s Davis, CA home is like being a kid in a candy shop for art lovers. Everywhere you turn you are face-to-face with art: hundreds of ceramics works, sculptures, and paintings in varying sizes and colors. Hanging from floor to ceiling, much of the art on display is Fitz Gibbon’s own creation. Scores of other works on view are pieces she has collected from other artists, many of whom she knows personally. Up and down staircases, canvas and ceramic faces stare out from the walls. The kitchen serves up localvore vegetarian foods along with Fitz Gibbon’s own exotic ceramic fruits and vegetable creations. 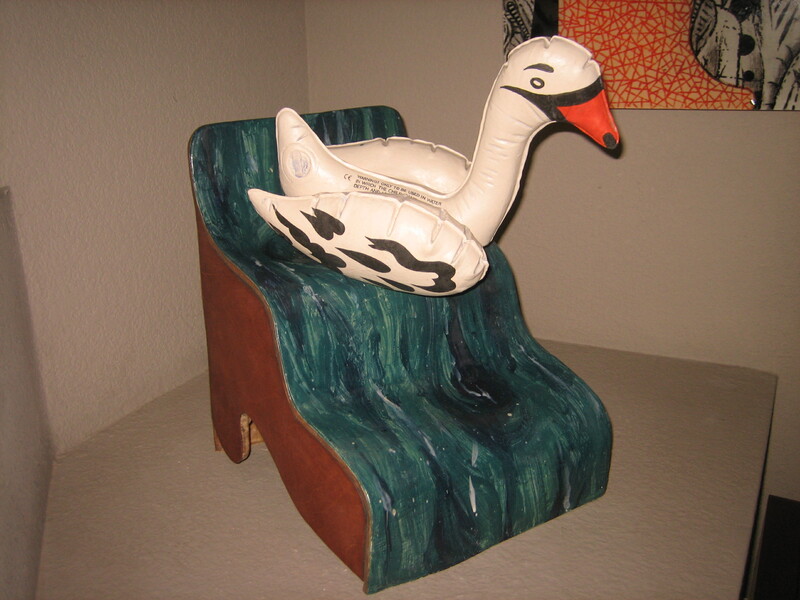 A baby grand piano (Fitz Gibbon is an accomplished musician) is covered with artworks. Even the bathrooms serve as gallery space. Some of it is fantastical in nature, some of it calmer and meditative. There are a lot of abstract pieces displayed along side examples of realism. All of it has a story to tell. Linda Fitz Gibbon’s living room/art gallery, Davis, CA, 2014. A native New Yorker, Fitz Gibbon earned a BA at Yale and an MFA from the Art Instistute of Boston/Lesley University. She currently serves on the Adjunct Art Faculty at Consumnes River College, Sacramento. 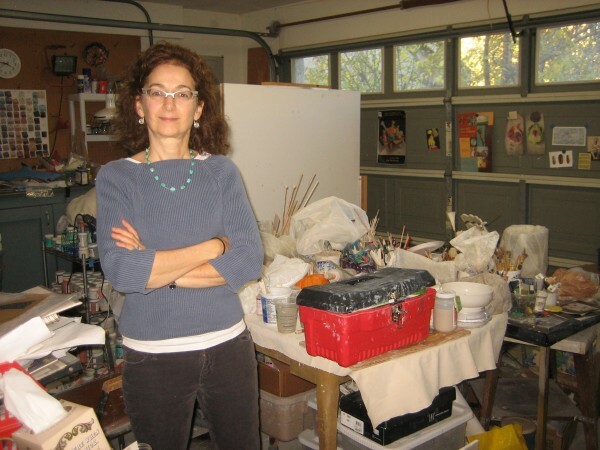 Her ceramic work, which she has described as “playful, abstract and weird,” is part of several museum collections including the Crocker Art Museum, Sacramento and the Yale University Art Gallery. 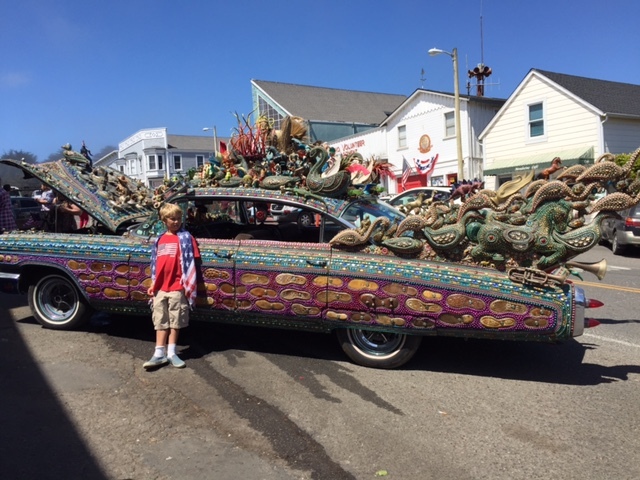 Fitz Gibbon’s work has also been featured in numerous juried shows and has appeared in galleries from Berkeley to Boston including the Shimo Gallery and B. Sakata Garo gallery in Sacramento, and the John Natsoulas Gallery and Pence Gallery in Davis. 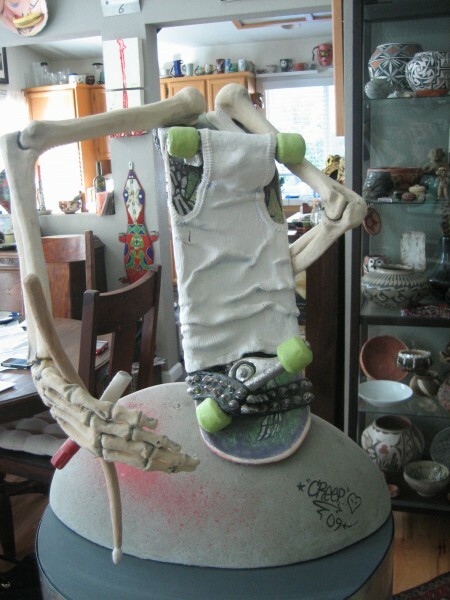 Fitz Gibbon’s art can be seen in an upcoming sculpture show at the Matsui Gallery in Sacramento City Hall from March to May 2015. She is also one of four artists recently awarded the YoloArts Artful Plate Commission, an art and agriculture collaboration. 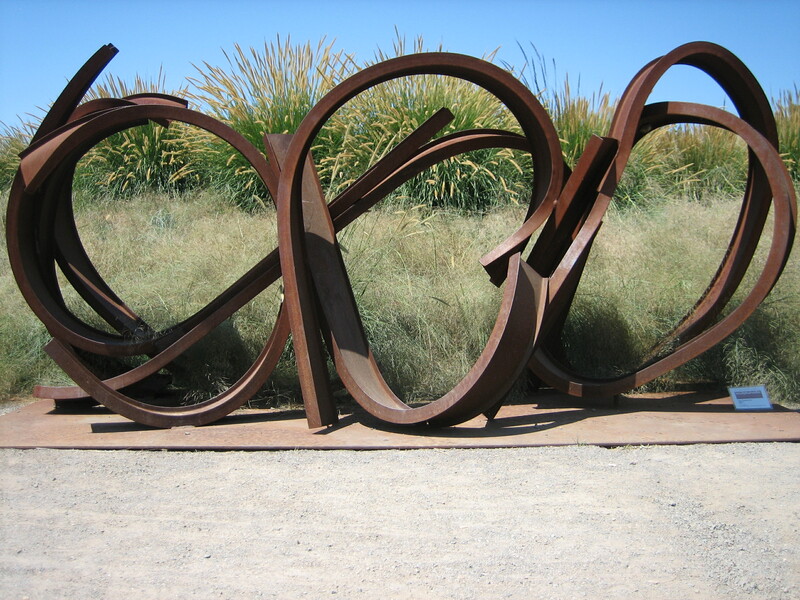 Each artist is paired with a restaurant serving seasonal, locally sourced food in Yolo County, CA, and will create a work of art that will be reproduced on dinner plates. Fitz Gibbon’s plate is paired with Monticello restaurant in Davis. The series of plates will be offered for sale along with specially coordinated dinners. A group show of the artists’ work opens February 6, 2015 at Gallery 625, Woodland, CA. Then in May 2015 the actual plates will be displayed. 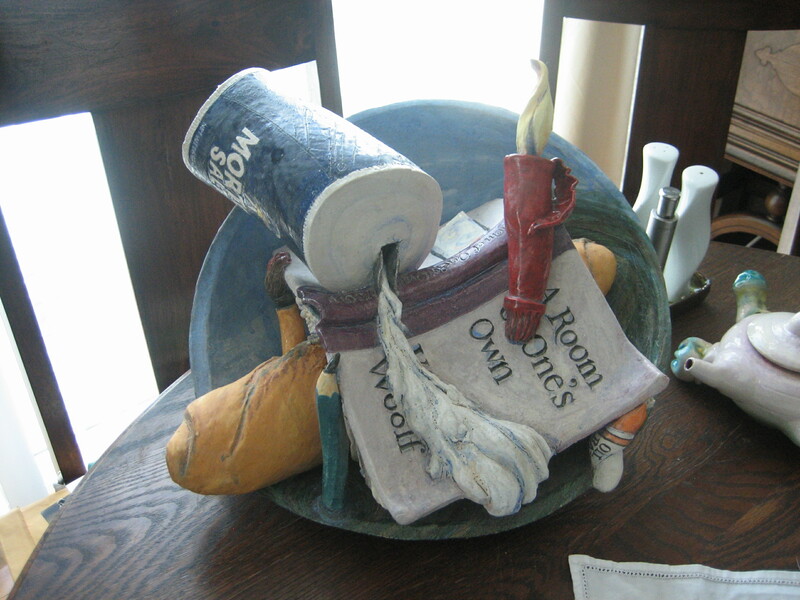 Linda Fitz Gibbon, House Warming, Clay, 2000. 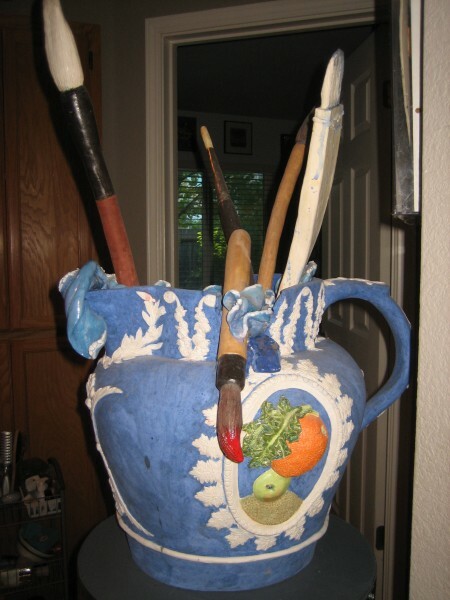 In May 2015, Fitz Gibbon will be the subject of a solo exhibition of food related ceramic artwork at the Monticello restaurant in Davis. Additionally, she has also donated an art piece for the upcoming UCD Nelson/Shrem Artfriends “Artists’ Valentine Redux” auction at the University of California, Davis. Exhibition dates for this show are January 17 to February14, 2015. Amazingly, this accomplished artist didn’t become serious about creating studio art until well after she graduated college where she studied art history and music. She worked as a book designer until computers took over. After realizing technology wasn’t for her, Fitz Gibbon discovered clay. 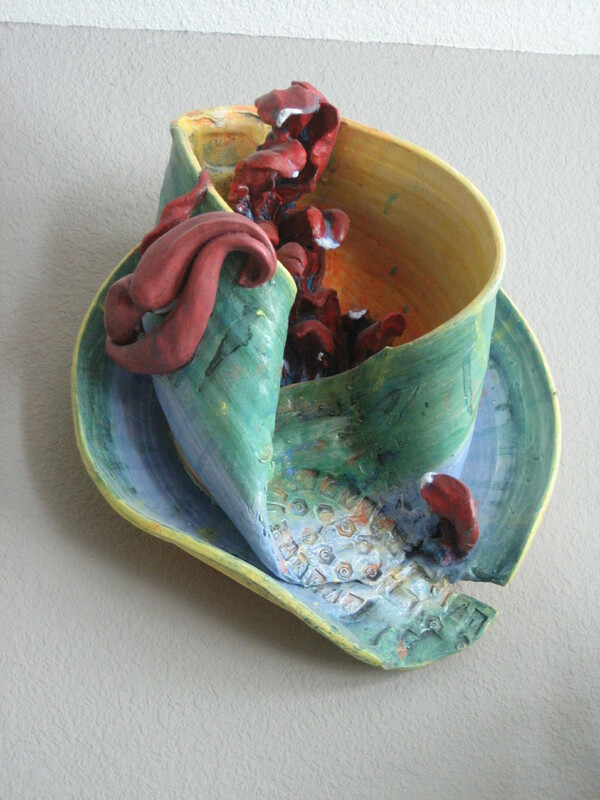 Linda Fitz Gibbon, Speak No Evil, Cup Runneth Over, Clay, 2001. 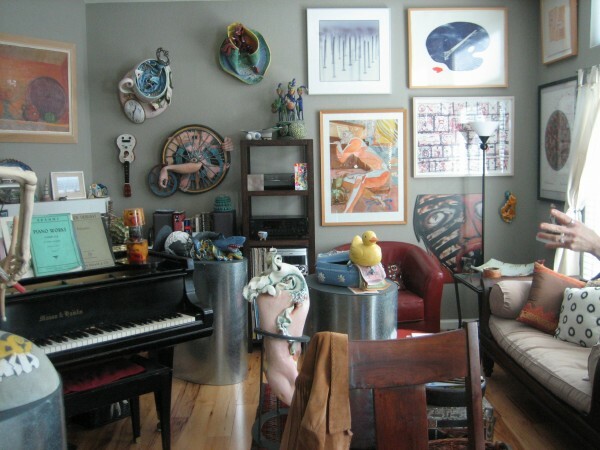 Surrounded by her art collection, Fitz Gibbon recently discussed her life and her work. LS: How do you describe your art? LFG: That’s a good question. I consider myself a ceramic artist. I’m a sculptor. If someone asks me what I do, I would say I sculpt. My main medium is clay. But now I’m beginning to introduce other media. I used to be a purist. I used to think I had to make everything out of clay. Now I see the benefits of using other materials. But I don’t like cold finishes. Whatever I’m trying to achieve on the surface with clay, I really think it’s important that it be fired. It gets back to the idea of why I’m working in clay. It has to do with the earth. I really think it should be fired and go through that process that is so magical. You start out with something that is malleable and mushy and it becomes rock. Not very many other media go through that kind of transformation. Things happen in the kiln; you only have so much control. It’s like raising kids. Linda Fitz Gibbon, Mirage, Mixed Media, 2012. 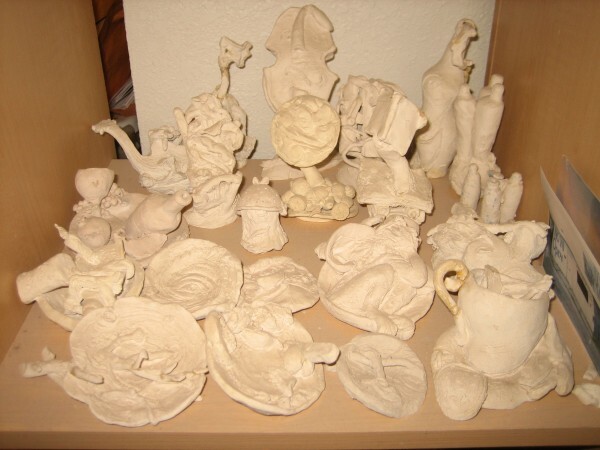 LS: What are your ceramic sculptures about? LFG: When I went for my masters and had to write a thesis, I realized that it had a lot to do with creative and destructive forces and the beauty and the grotesque and those elements working through life. Those are the driving forces behind the work, whether it be narrative or more abstract. I use art making as a way to work through things and find the positive. It becomes a concrete form of whatever it was that I was going through. I’m really inspired by things that grow. So nature is a strong part of what I make. A large part of my art has been narrative based. It’s telling stories through objects that I then represent in clay, which can be very symbolic, iconographic and literal. But then I juxtapose them in a way and a lot of times there’s humor as a result. I’m playing with balance. That’s another main theme. Linda Fitz Gibbon, Slippery Slope, Clay, 2012. LS: Do you have a subject in mind when you begin a new project? LFG: If it’s a narrative piece, I usually do. It depends where the idea that is generated comes from. If it’s something that is related to an experience, I might look for symbols. For instance, the Wedgwood pieces, or Neptune’s Demise, came from the B.P. oil spill. My more abstract work was based on Dante’s Inferno. I normally don’t just sit down and play with the clay. I’ll have some idea in mind before I set out. 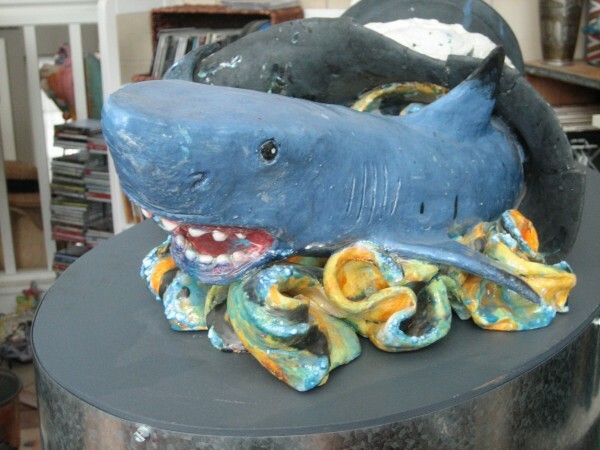 Linda Fitz Gibbon, Neptune’s Demise, Wedgwood Cup Runneth Over, Clay, 2010. Linda Fitz Gibbon, Portrait of the Artist, Wedgwood Cup Runneth Over, Clay, 2010. LS: What do you do in your studio? Can you briefly describe your process and your tools? LFG: When I’m in the studio, I’m hand building. I’m using coils, slabs, pinch forms, and slump molds. So I’ll slump a slab — that’s how a lot of my bowls are made. Usually I sketch the form first. I have an idea before I go ahead. For my larger pieces, I’ll make a maquette or prototype first. I’ll build it out of clay and then I’ll scale it up. I work out the proportions in three-dimensions, so that when I go to hand build, things will be in the right proportion. A lot of my pieces are made in sections. Linda Fitz Gibbon, recent maquettes, clay, 2014. LS: What obstacles do you face? LFG: Because of the size of my kiln, a lot of my pieces will be made in parts and then put together. LS: Where did you learn to work in clay? LFG: I did a little bit in high school, then took some classes at the Davis Art Center (after college) and realized: ‘Oh my God, this is my medium.’ In college I had one year of drawing and I studied art history and music. 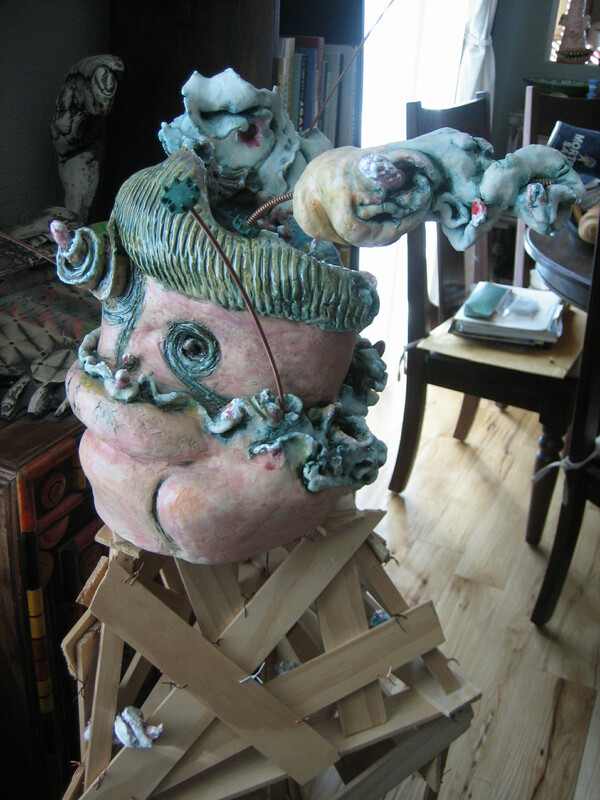 Linda Fitz Gibbon, Bobble Head, detail, mixed media, 2012. LS: Did you always want to be an artist, to make art? LFG: No, I wanted to be a musician. I wanted to be a pianist. That’s really my first love. But on the other hand, art is just part of my genetic makeup. I always had a sketchbook. I was always drawing. I just never thought of myself as an artist. It was always something I did but I never dreamed that’s what I would become. My parents always encouraged us because they had art materials all over the house. (LS Note: Fitz Gibbon’s parents are artists). LS: Have your children have picked up the mantle? LFG: My oldest daughter, Lucy, is a soprano. She wants to be an opera singer. I think she has a promising career. My daughter Elaine is a cellist and is a student at Princeton getting a Ph.D. in German literature. My son Jack is a graffiti artist and muralist. He is also interested in archeology and anthropology. Linda Fitz Gibbon, Portrait of Jack (from the back), clay, 2009. LS: As an adjunct faculty member at Consumnes River College in Sacramento, what are you teaching? LFG: Right now I’m teaching beginning wheel. I’m teaching students the basics of pottery: how to center clay on the wheel, how to create cylinders. From the cylinder you can make bowls and mugs and cups and vases and teapots. They learn to make the basic forms and then hopefully to express them. The beginning class is about learning the technique. It’s very much like learning to play an instrument and practicing over and over again. You really need to practice centering and pulling the clay up. People come in thinking it’s going to be an easy class. But it’s quite challenging because you intuitively have to figure out for your own self, how to do it. I can teach it, but then that person really has to work out how to move the clay and at what speed. Things collapse and it can be very frustrating — also lots of fun. 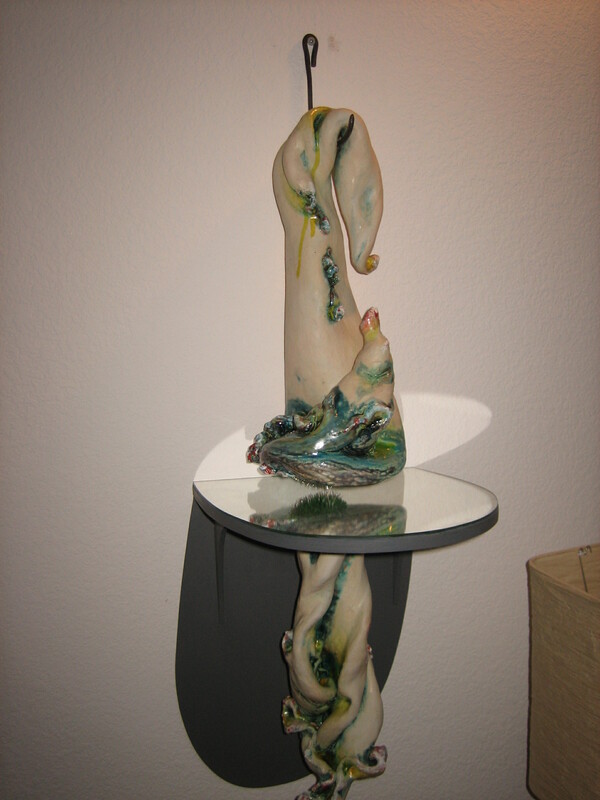 In class we use a high-fire type of glazing which is very different from the glazing that I do in my studio. Maybe someday I will wind up using those techniques in my work. Teaching is good because it stretches me. LS: Are there any artists that you particularly admire or are influential? LFG: Viola Frey, Annabeth Rosen, Richard Shaw, Arthur Gonzalez, Robert Brady, Peter VandenBerge, and Julia Couzens. The mentors that I studied with include: Jim Melchert, Robert Ortbal, Jan Nunn and Lucy Pauls. They were all instrumental in my getting my Masters in Fine Art. I really admire their work as well. My ex-husband’s father was John Fitz Gibbon (LS note: He was a critic, artist, collector and educator). I must say he was a very difficult man, but brilliant, and I learned a lot from him. A lot of my art education came from just going up there (Pilot Hill, CA) on a weekly basis and interacting with that art collection. It helped shaped what I do. So when you ask about influential people, he was definitely one. Linda Fitz Gibbon, Doppelganger II, 2013. LS: You recently earned an MFA. Do you have any plans to continue your education and earn a Ph.D.? LFG: I don’t really have specific plans to get a PhD. 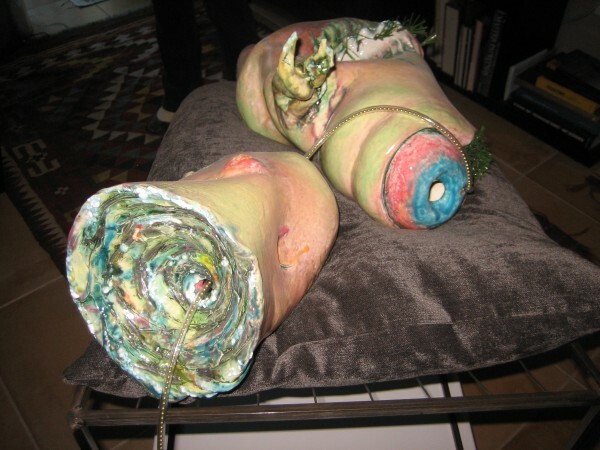 But I do want to continue pushing myself to keep my mind churning and be active in the contemporary art world. LS: Is there anything else you want to share that I haven’t asked you? LFG: I have gone through radiation and breast cancer. It was a life altering experience, like the rug got pulled out from underneath me. I never would have expected that. It’s not in my family. I eat really well — no processed food, mostly organic. It really upended my psychological being for a while. You have an idea that you’re going to just live into a ripe old age. Then these things come up. It put a different spin on my life. It makes me more appreciative of the really wonderful people around me: my kids. It makes you a little more willing to let go of things that are not good and realize that you can only do so much. 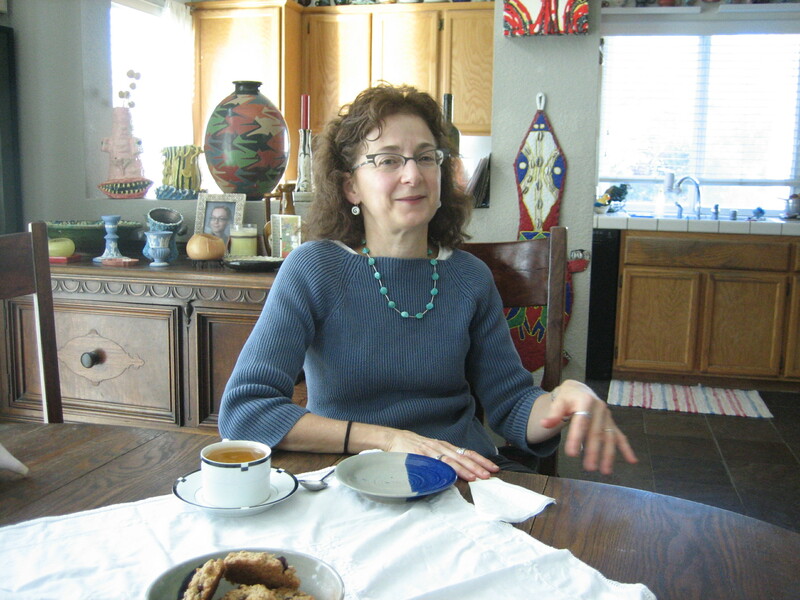 Linda Fitz Gibbon discussing art and life, Davis, CA, 2014. Linda is a powerful role model and deserves much wider recognition in the art world. Thank you for adding to the growing consensus about the worthiness of her work.